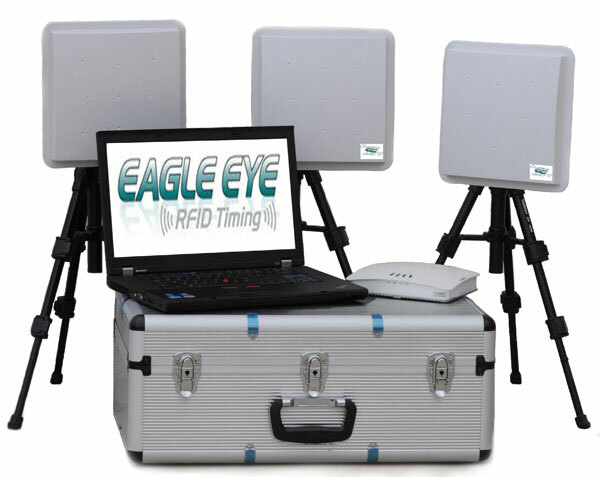 Eagle Eye's three antenna system provides the reliability Pro timers demand for large events, while giving small operators the simplicity they've been looking for. The system can also be paired with an unlimited number of readers/ antennas (read zones) for your custom event or application. Mounted on portable tripods, the RFID antennas eliminate the need for expensive overhead towers or dangerous ground mats. Athletes simply run past the finish-line while the timing computer captures the finishers in real-time. Specialized feature rich software, ranks, splits, scores, etc. and operates your event with efficiency and speed. Also integrates with Hy-Tek. The Eagle Eye RFID system is designed to read shoe tags, however can be used in numerous configurations with tags pinned to the bib, hip or body of the athlete. System compatible with most third party UHF tags.